In Nicaragua, national peaceful protests over legislation turned violent, resulting in over a hundred deaths and more than a thousand people wounded since mid-April. The Catholic Church in Nicaragua is playing an instrumental role in peacebuilding and mediation, leading one of the nation’s largest peace marches on April 28. The Church is a mediator in the national dialogue, brokering release for many detained protestors and providing water and medical care to the wounded. Your gift today will help CRS support the Church and our local partner Caritas National with much-needed medicine, medical supplies and transportation for health personnel. As the largest of the Central American countries, Nicaragua is also one of the most ecologically diverse. Lakes, volcanoes, rainforests and wide agricultural plains provide the setting for amazing biodiversity and tremendous potential in agriculture and natural resources. While Nicaragua’s soils are some of the most fertile in the region, crop yields continue to lag behind neighboring countries. Nicaragua is the second-poorest nation in the Western Hemisphere, with approximately 80% of the population living on less than two dollars a day. But until the recent civil unrest that started in April, it remained the safest country in the region, largely escaping the gang and trafficking violence so prevalentg around the region. Nicaragua’s social indicators also rank among the lowest in the region, commensurate with its relatively low per capita income level ($1,849 in 2015). The country has historically suffered from frequent earthquakes and hurricanes and is increasingly vulnerable to natural disasters. Hurricane Felix and disastrous rains in 2007, drought in 2009, flooding and landslides in one of the wettest rainy seasons ever in 2010, and severe drought again in 2014, serve as grim reminders of Nicaragua’s increasing exposure to extreme and damaging weather patterns. CRS Nicaragua manages a large portfolio of agricultural projects serving the country’s poorest and seeking to sustainably increase their food production, incomes, and access to markets. Yield improvements are sought through a focus on improved soil and water management that will also increase the resilience of the producers and their communities in the face of climate change. Agroforestry with cacao and coffee, conservation agriculture with corn, beans and vegetables, and managed forage and trees for cattle are among the crops and systems that CRS promotes in Nicaragua. A small program has also been designed to provide a foundation for sustainable development in the provision of quality water and sanitation services. Interventions include: Supporting communities and local government to improve water and sanitation infrastructure; build local organizational capacity to manage water systems sustainably; and promote improved hygiene and sanitation practices in households and schools. In addition, CRS works to improve communities' ability to manage and reduce risks and to prepare for and mitigate future emergencies. Activities that improve the communities' capacities include vulnerability mapping, evacuation plans, and training in the above-mentioned agricultural practices that build their defenses against extreme weather and mitigate the impacts of shocks such as drought, flooding and epidemics. Rising crime across Central America has become a significant international concern as it threatens democratic development and slows economic growth. In particular, the spread of gang activity and expansion of cross border networks and illegal activities, particularly drug trafficking, have led to increasingly serious insecurity in Mexico, Guatemala, El Salvador and Honduras. While these problems have not yet affected Nicaragua to the same degree, the country suffers many of the same underlying causes and risk factors, raising concerns that the issues will continue to spread south. Implementation of CRS’ saving’s-led microfinance methodology in Nicaragua has helped mitigate and prevent issues faced in other Central American countries. Called Savings and Internal Lending Communities (SILC), this method generates within communities’ women leaders, a greater availability to save in times of scarcity, access to credit, the creation of local employment and an increased income for families. SILC is contributing significantly to the development of local capacity and resilience, which is why it has become a cross cutting activity in projects throughout the country. 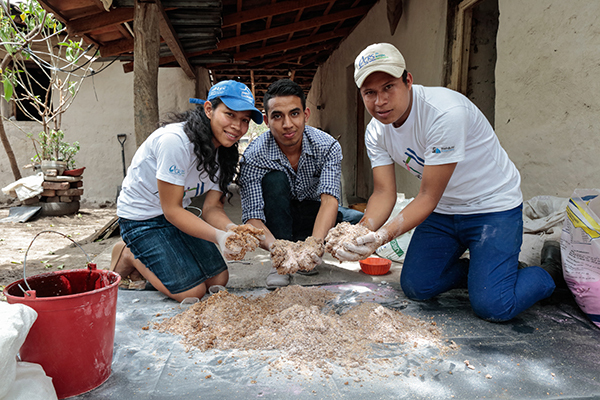 In addition, and since 2007, CRS Nicaragua has worked with the Youth Builders development methodology to educate, train, and place unemployed, marginalized youth in employment and self-employment livelihood opportunities. The model uses life-skills training and community-based service projects to help youth acquire critical leadership, employment, and/or enterprise development competencies. An innovative project involving smallholder farmers aims to reduce poverty among participating farmers, and to mitigate climate change by reducing greenhouse gas emissions. Catholic Relief Services began working in Nicaragua in 1964. CRS provided disaster relief, distributing food, clothing and medicine after a powerful hurricane. During the 1970s, CRS continued to implement a food program for school-aged children and introduced a groundbreaking "revolving funds" project, which was to become a precursor of microfinance and other financing mechanisms for agricultural producers. In 1972, CRS responded to the Great Earthquake in Managua, which killed 10,000 people and left 300,000 homeless, with a $6 million, multi-year reconstruction effort implemented with Caritas Nicaragua. Between 1979 and 1990, given the insecurity of a country at war and the logistical difficulties caused by a trade embargo, program staff relocated to Costa Rica and provided assistance to Nicaragua during natural disasters, particularly after Hurricane Joan in 1988. In 1990, CRS reopened an office in Nicaragua with a special emphasis on strengthening key relationships with government ministry officials, local church representatives, and in-country partners and donors to address the volatile, post-conflict period. In 1998, Hurricane Mitch -- which killed 3,800 people in Nicaragua -- highlighted the country's extreme vulnerability to natural disasters and their impact on the poor. Hurricane Mitch brought about a renewed focus on the importance of justice as a motive for programs designed to address poverty. On a global scale, CRS began promoting greater awareness of justice issues in development, which in Nicaragua found expression in Global Solidarity Partnerships. Designed to connect Catholics in the United States and Nicaragua, such outpourings of international solidarity resulted in the construction of bridges in the areas worst hit by Hurricane Mitch. In the process, other bridges of understanding formed between the two countries. The devastation caused by Hurricane Mitch was soon followed by another crisis, the collapse in 2001 of international coffee prices. With so many small-scale farmers and day laborers relying on coffee for survival, Nicaragua was particularly hard hit. The crisis, which pitted hungry and unemployed coffee farm workers against landowners and the government, threatened to erupt into violence. Supported by CRS, the local Catholic Church led efforts to defuse the situation, calling for dialogue, immediate relief and long-term development assistance. This experience became an entry point for CRS to promote the concept of fair trade and justice-based commerce in general. Working through small producer cooperatives, CRS opened markets in the United States for fair trade-certified coffee, while simultaneously promoting organic coffee production and crop diversification. Building on work done following Hurricane Mitch, in the 2000s, CRS Nicaragua increasingly focused on agroenterprise programming, which beyond increasing productivity, focused on the skills and conditions necessary to add value to farm produce and connect farmers to higher value markets. CRS’ agroenterprise programs have benefitted more than 12,000 producers and generated millions of dollars in economic development in Nicaragua’s rural areas.